When I first looked locally for what they called “gallery representation,” I had a talk with a gallery owner who told me it took twenty years to make a painter; i.e., such a relationship was a big investment for him. It was 1995 and I was 60 years old. Looking me over, he said that he didn’t think I had that long. (Even if I get credit for the past 5 years? I wondered.) This fellow shall remain nameless though I remember his realism. Unrepresented to this day, I’ve stayed at the easel the required length of time, and finding myself still standing, believe it’s time to have a virtual look at the trail behind—and, perhaps, some space ahead. For starters, begin in the middle: so here’s Bringing Forth II: an inception with prospects for forward movement, Bringing Forth II (though it invokes conception) is hardly conceptual art although it has certain narrative qualities & some written content. It makes a good point from which to summon up a sample of works over time, alongside thoughts about how I look at them. 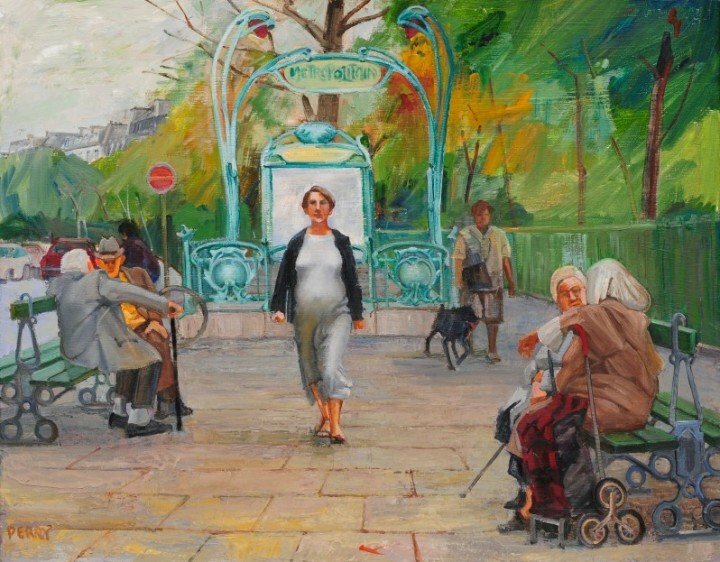 The painting features a central figure whose bulges are echoed in the art nouveau carvings that decorate an overarching Paris Metro entrance . Conception began during a walk along the park where the Canal St. Martin goes underground on its way to the Seine. One Sunday on the way to the market at Bastille Place, a pregnant woman entered the space ahead, and I reached for my camera. (It’s my habit to go about with the little black box, some kind of insurance that not all the wonders will be lost).